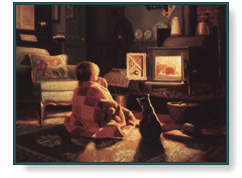 Snug as a Bug by Ron Bayens depicts a young boy warming up during a cold winter evening with a cozy quilt, a plush teddy bear, and his cat. Snug as a Bug copyright © 1991 by Ron Bayens and is prohibited from being copied without permission. All applicable copyright © laws apply and are reserved by Christ-Centered Mall, Inc.